Dozens of South Florida’s mainstream and Caribbean media were hosted on the grounds of History Fort Lauderdale on April 3rd, for the official media launch of The Taste the Islands Experience (#TTIX2019) event weekend. The team at Island Syndicate, lead producers of the 3-day event, were on hand to meet and greet sponsors, partners, talent, media and other stakeholders in the occasion. Attendees enjoyed Korbel champagne, light island bites, and Caribbean music courtesy of Sir Rockwell. Then the audience was treated to a preview of what the 3-day event would have in store. Island Syndicate Creative Director Calibe Thompson painted a picture of three exciting event days from April 26 to 28, each with delicious culinary profiles and each with unique characteristics. 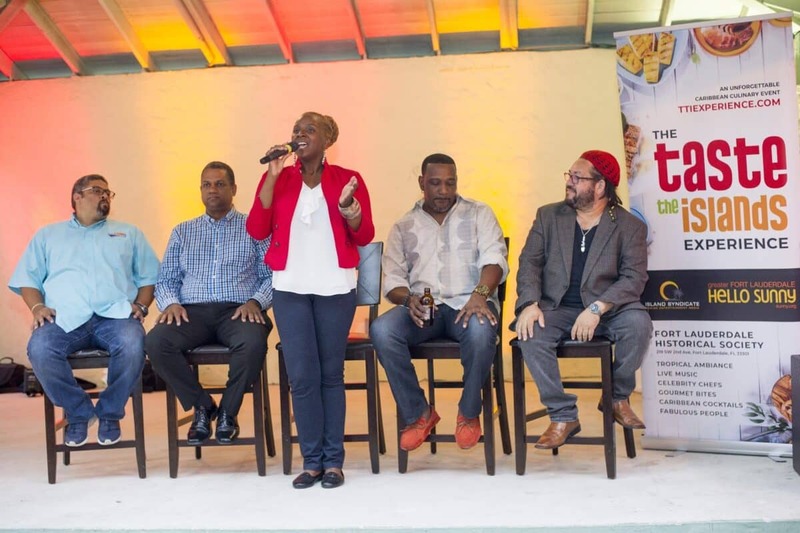 The company’s Brand Strategy Director David I. Muir, host of the Taste the Islands TV show Hugh “Chef Irie” Sinclair, and Friday night TTIX Under the Stars producers Tyrone Robertson and Daniel Abbott interacted with the audience answering key questions about how the events would unfold. Closing with a few words were island partners from Barbados and the US Virgin Islands, who shared their individual experiences and evolving relationship with the team and event. Building on last year’s success, the main event on Saturday, April 27th will maintain standout features like their Island Pavilions-this year featuring Jamaica, Barbados, The Bahamas and the US Virgin Islands; Restaurant Row-featuring regulars like Reed’s Catering with their signature conch salad, and newcomers like Yani Booze alcoholic cupcakes; the chef and mixologist demos on the main stage, glam and massage studios, and the Culinary Museum activation. New Saturday features will include the Arrival / Departure Lounge stage-with live music, rum sommelier presentation, and chef panel; guided Tasting Tour offering a virtual tour of favorite Caribbean destinations; and The Julian Marley Experience-where purchasers of full price tickets get an autographed CD and a meet and greet with the singer. On Friday, April 26, the weekend will begin with a night of live island music, and multiple courses of passed gourmet tapas prepared by visiting chefs from the Caribbean. The weekend will draw to a close on Sunday, April 28 with Brunch on the Sunny Side featuring a Caribbean brunch buffet, curated mimosa bar, and couture fashion show. See the complete event photo album on Facebook. Learn more about The 2019 Taste the Islands Experience at www.ttiexperience.com.